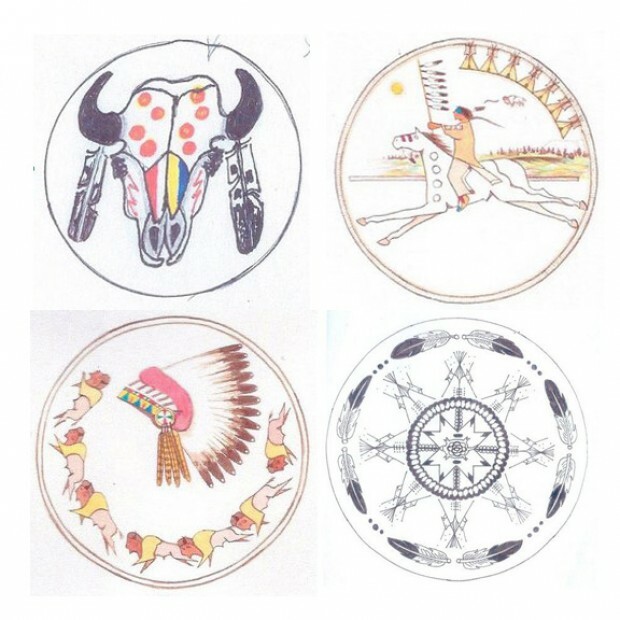 By Doug DemmonsThe Oglala Sioux Tribe will soon have its own set of privately minted commemorative coins with designs honoring Native American heritage and culture. The Native American Mint, which produces and markets coins for other tribes, held a contest to design a one dollar coin, as well as five other coins of smaller denominations. The winners were announced Wednesday. The private mint, based in California, plans to produce some dollar coins in silver. Other dollar coins and the smaller denomination coins would be minted from a copper-zinc alloy, according to Garry Bishop of the organization Serving the Lakota, who organized the design contest. All of the coins would be offered in uncirculated condition, and the dollar coin would be available in about six months. No proof editions would be minted, Bishop said. The coins would not be legal tender and could not be used as money, which would be a violation of federal law.Below: "The winning and runner-up designs for the Sioux Nation dollar coin to be issued by the Native American Mint have been released." Comment: I guess the first two designs are the winners. I like the second one best. The first one would be good if it were drawn by a good artist and perhaps shown in a three-quarters profile. For more on Native-themed currency, see 100th Anniversary of Buffalo Nickel and Aboriginal Art Removed from Canada's $20 Bill.